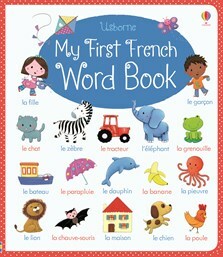 A delightful, and very simple, illustrated word book to help children build their French vocabulary. There are over 270 French words for children to spot, talk about and learn, each brought to life with a colourful illustration. Words are grouped into themes including ‘Animals’, ‘At home’, ‘My body’, and ‘Bedtime’ to make them easier to remember. With sturdy board pages designed to withstand being looked at time and time again.